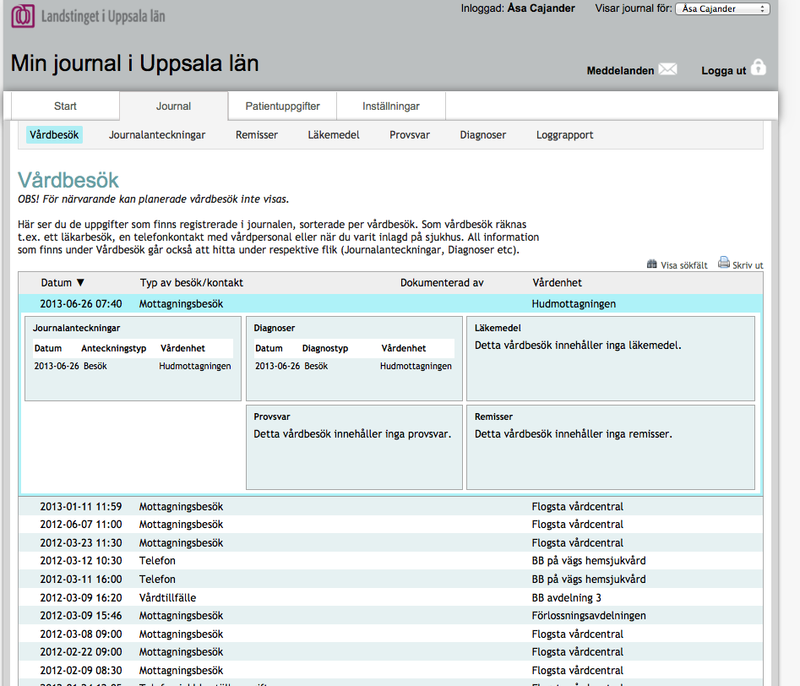 When medical records online was launched in Uppsala County Council a few years back many health care professionals were concerned, to say the least. There were for example some very upset discussions especially regarding cancer patients and medical records online, and the possibility to get bad news through a web page. 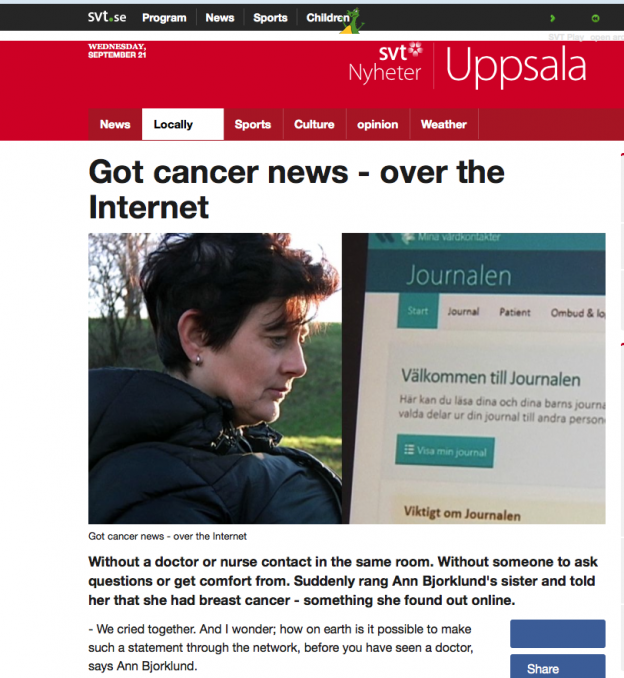 There were also critical incidents regarding patients reading their test results and getting a cancer diagnosis online, as in the screen shot that is the featured image in this blog post. The article is a Google translation from Swedish, and the original article can be found here. The news article describes the story of a woman who got to know about her the return (?) of her breast cancer through logging in at a web service. This specific critical incident occurred in 2015. Is reading your medical records online really a good idea for patients with diseases such as cancer? What do cancer patients in general think about the system? Is it useful for them? As a result of this turbulence around medical records online and cancer patients DOME did an interesting study with interviews with 30 cancer patients. I did this study together with my PhD student Hanife Rexhepi (I’m co-supervisor), Associate Professor Rose-Mharie Åhlfeldt and Professor Isto Huvila. We presented this study at Vitalis, and you can see the presentation here (in Swedish), we wrote a Swedish white paper on the study found here and also a journal paper in the Health Informatics Journal. They are curious about what it says in the text, and in the test results. To prepare for the next appointment with a physician. To get a feeling of being in control when it comes to their decease. As a memory aid when looking at what has happened so far with their decease. To be able to understand what the physician said in the meeting. To read up on the latest test results, and to compare to previous results. To get the exact information, and not an interpreted oral version. One of the worries that health care professionals have is that patients would become worried, and some patients said that of course it is worrying to read about the decease sometimes. I personally want to know. Even though it is tough. It is not less tough to get to know it a few days later, or by someone who wraps the bad message inside mumbo jumbo words to soften it and says that it is not too bad and so forth. No, I want straight answers. One should note that all 30 patients in the study thought that being able to read the medical records online is a good reform, and that the system should exist as a possibility for those patients who want it. I have had a meeting the Oncology department at the hospital to discuss the possibility of doing a follow-up study on patients reading their medical records online. Some of the things we want to understand is the use and non-use of the system, and how it affects patient empowerment. We also need to do a follow up study because there is a risk that the people that we interviewed were early adopters of the system, and we want to find out what the mature users think. So there are more studies to come in this interesting area! This entry was posted in DOME, eHealth, Medical Records Online and tagged DOME, eHealth, paper, users on 2nd October 2016 by Åsa Cajander. 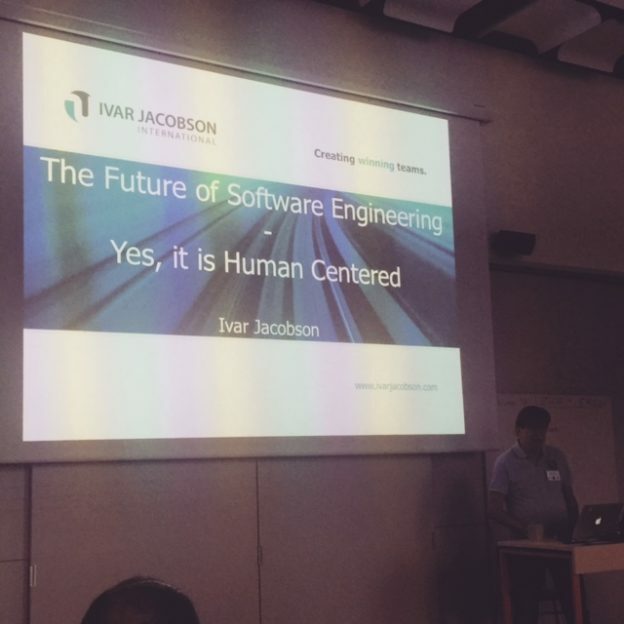 I listened to a very interesting key note by Ivar Jacobson on the future of software engineering. Many of the things he said were spot on true, and some were a bit provocative and I disagree, but the talk was still very interesting. One cornerstone of learning in an organisation, according to Jacobson, is the common ground and a common vocabulary. And we need methodologies, processes and a common vocabulary to coordinate the work with ITC in organizations. Work that includes several thousand people cannot be only creative design. Essence – a standard that defines the smallest set of concepts that are common to all software projects – helps embed agile professional practices and governance across an organization for sustainable, scalable and responsive solution delivery. 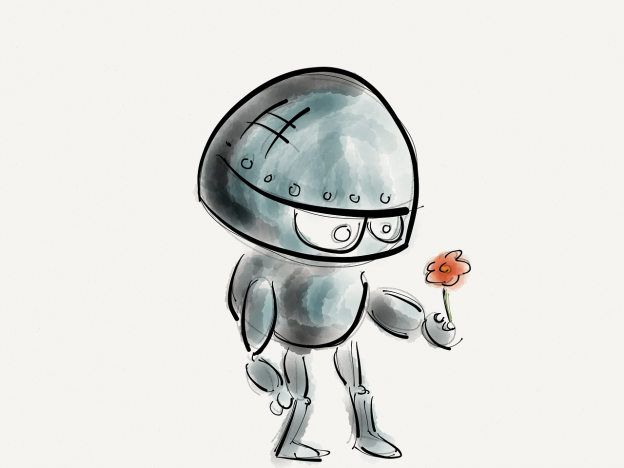 The future of software engineering is human centred, of course, but there is still some way to go before we are there . According to Ivar Jacobson the way forward is to create a learning organisation, that includes a kernel of common concepts and knowledge. I agree with him completely, and the problem is how to create this situation. Perhaps action research and practice oriented research is the answer to this question? This entry was posted in Agile, software development, software engineering and tagged Agile, Key Note, User Centred Design, users on 14th September 2016 by Åsa Cajander. Friedman’s ideas of Value sensitive design has been around since the 1990’s, and the idea behind it is really good. 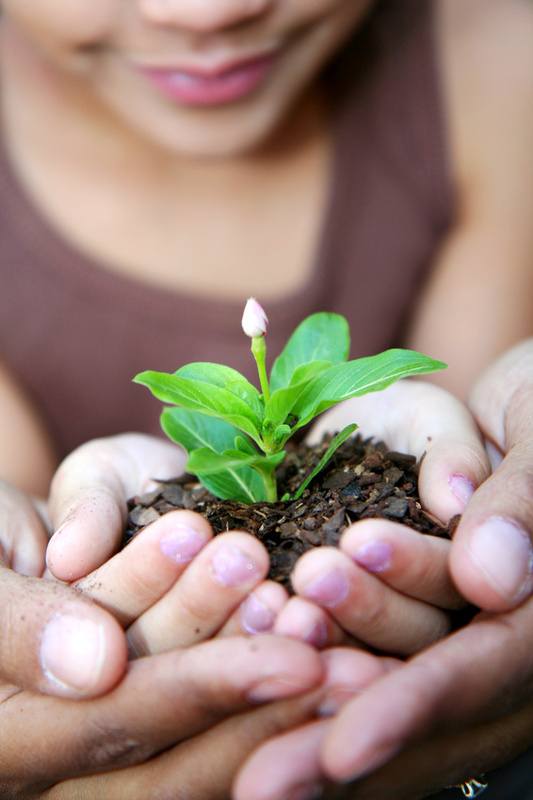 We should be aware of our values and incorporate them in systems development. Cockton has also made some contributions in the field of value, but he looks more at the value perceived by customers than the value of the systems developers. I also worked some with values as my first area of research, and did my licentiate degree on Values and Perspectives Affecting IT Systems Development and Usability work. My focus was on what values are at the core of the decisions made in companies when it comes to software development. Not surprising money, time and automation were values that collided with the values of user-centred design. One can wonder why this way of thinking is not present in software development processes such as agile development? It feels like the value sensitive design and the ideas behind that are completely off, even though agile generally has a very strong focus on working teams, humans, communication and leadership – not to mention speed. Perhaps it would be easier to discuss values in software development today than ten years ago due to the discussion about sustainability? Perhaps things have matured and we have another way of thinking than before? Hmmm. Or perhaps not? This entry was posted in software development, Uncategorised and tagged Agile, User Centred Design, users on 10th September 2016 by Åsa Cajander. Robots Instead of Health Care Professionals?? I listened to the introductory key note from the conference Human Centred Software Engineering by the very inspiring Danica Kragic on social robotics. Clearly robots such as avatars of humans will influence work very much in the future. One of the areas of application is health care. 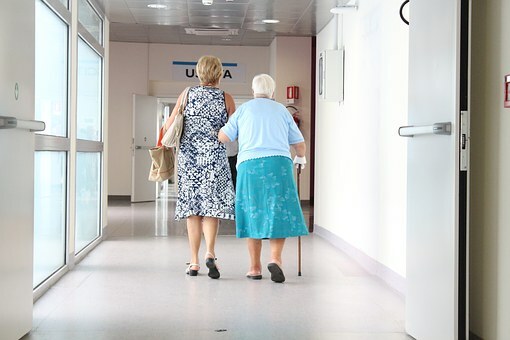 Danica Kragic mentioned health care services such as Cognitive Behavioural Therapy, and research has indicated that this might be a possible future avenue. Physicians would collaborate with robots in their work, and part of the work would be replaced by robots such as some part of the therapy. Hmm. One can wonder what the reactions from physicians would be if we start doing research on replacing them with robots or machines? And how would the patients react to robots? Perhaps not as negative as one could think? One can also wonder how the professional competence of health care professionals can be transfered to robots? Is this possible? 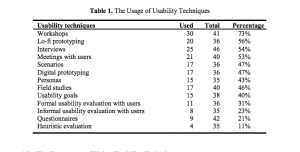 This entry was posted in Agile, eHealth, Professional Competencies, software development and tagged eHealth, User Centred Design, users, UX on 7th September 2016 by Åsa Cajander. Technology change human work, changes responsibilities, change decision making and we are losing knowledge and competencies, according to a paper by Holger Fischer and Björn Senft presented at the Human Centred Software Engineering Conference. Their research is then on how organisations should work to ensure that the systems build to support this work are usable, and conform with standards. Unfortunately the paper does not present the silver bullet to how this should be done ;-). 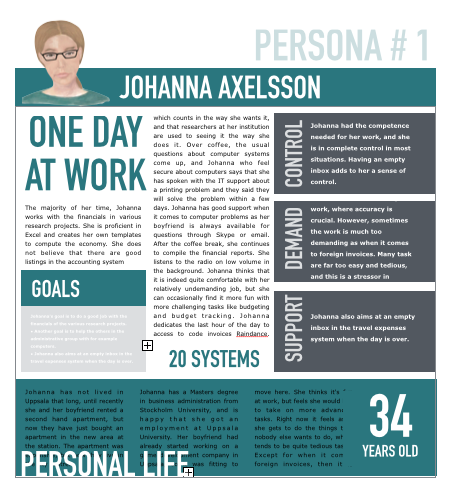 This entry was posted in Agile, software development and tagged Agile, User Centred Design, users, work on 3rd September 2016 by Åsa Cajander. 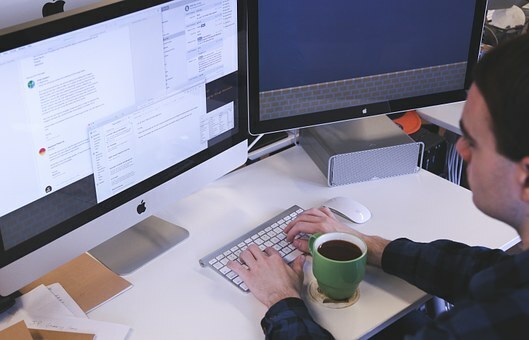 We have developed a new method for including the user perspective and the user’s digital work environment in software development. 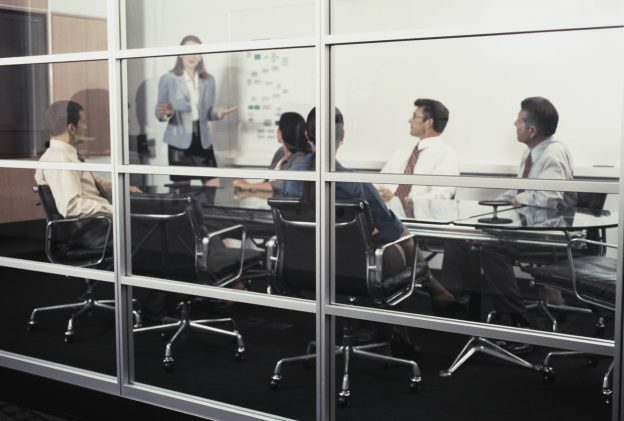 The method is an adoption of the persona’s method where work environment aspects are included, and can be used when designing or procuring IT systems. 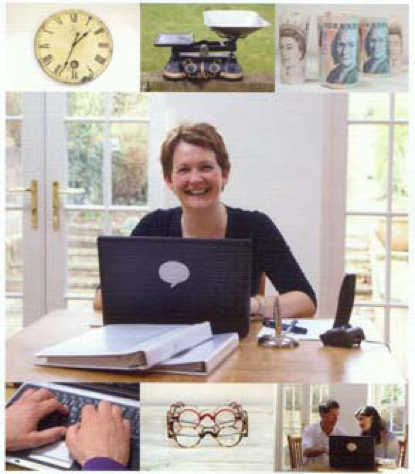 The method describes the holistic uses situation of a person with the 10-20 different IT systems that are used at work. It is based on a well known theory by Karasek and Theorell regarding control, demand and support in relation to stress. For further reading see our book chapter on the topic. It is published in a Springer book. This entry was posted in Agile, software development and tagged Agile, User Centred Design, users, UX on 28th June 2016 by Åsa Cajander. The full white paper (in Swedish) can be found here. This entry was posted in DOME and tagged users, UX on 11th June 2016 by Åsa Cajander.